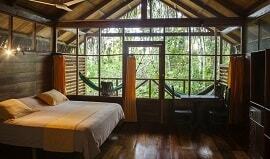 There are several excellent lodges from which you can explore the Ecuadorian Amazon Rainforest. A short flight from Quito to Coca is followed by a boat trip and possibly then by a short walk to your home in the Amazon. We recommend a minimum of 3 nights, which affords two full days to explore the forest, on foot, by boat or by canopy walk-way or tower – all accompanied by an expert naturalist guide. Given your remote location your accommodation is very comfortable. The following describes the experience as opposed to giving you a day-by-day ‘itinerary’; daily activities vary dependent upon interest, the weather and sometimes luck (i.e. 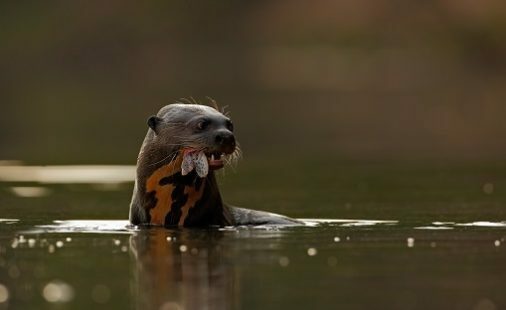 if a family of Giant Otters are known to be active in a nearby ox-bow lake your guides will ensure you have the chance to see these amazing creatures). You will be met upon arrival at Coca Airport and transferred to the port for your river transfer to your lodge. As mentioned there are several comfortable lodges that offer a range of rooms, either thatched cabanas or rooms built into part of a central lodge, private facilities, hot and cold showers, window screens, mosquito nets over the beds as well as ceiling fans help make the stay very pleasant. The lodge guides are excellent and the food is also of a high quality. Many guest are surprised by the standards and that an Amazon stay is a truly rewarding and relaxing experience. A comfortable eco-lodge located on the shore of Lake Garzacocha. 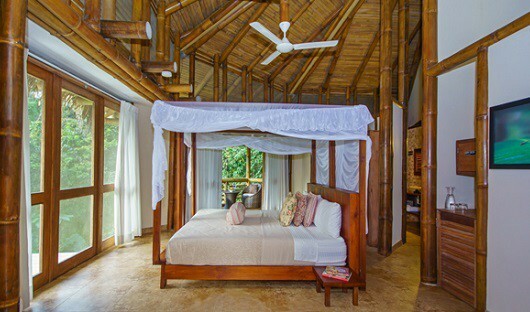 La Selva’s thatchedroof bungalows are entirely made of secondary rainforest materials, designed to blend with the rainforest. Walkways connect traditional rooms and family suites, as well as the 12 exclusive Eco-suites, to the lakeside bar/lounge. A spacious dining room serves delicious Ecuadorian-fusion cuisine using organic ingredients from the lodge’s own garden. Located inside the Yasuni National Park, within the ancestral lands of the Anangu Quichua community, this highly-regarded wildlife centre offers 16 comfortable cabañas featuring modern amenities. The centre actively protects 212 sq. 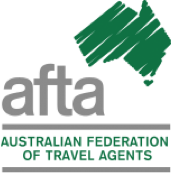 km of pristine rainforest and offers the easiest access to two nearby parrot clay licks. 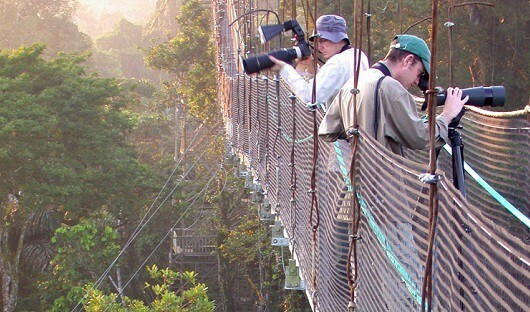 A high viewing tower provides a 360° view of the surrounding wilderness, where flocks of colourful tanagers and blue-and-yellow macaws pass through the canopy, and large toucans call in the early morning. 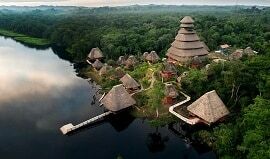 Sacha Lodge stands on the lower Napo River, 80km downstream from Coca and overlooking a tranquil oxbow lake. The lodge has been carefully constructed to step gently upon the environment. 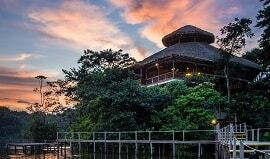 The cabins are built up above the jungle floor and connected via a network of raised and covered walkways to the main lodge, the butterfly farm, dock area and swimming platform. Designed for maximum privacy, the large screened rooms feature polished wooden floors, modern bathrooms, and ceiling fans above two double beds, while the high thatched roofs provide shade for private decks, making them a perfect spot to relax on hammocks between activities and to watch out for wildlife. Exploring the Amazon takes many forms. Forest walks; all lodges have a series of trails along side the rivers, streams and around any trees of significant interest. Walks often focus on the flora as well as any ground living creatures (poison arrow frogs, giant snails etc). Some of these walks are taken early in the morning or in the afternoon as well as shorter night walks. Canopy towers and walkways. Many of the rainforest inhabitants spend there days high up in the forest canopy, to afford access many lodges have built canopy towers, and or canopy walkways supported by steel-cables and strung between significant trees (often fruiting trees) that, after climbing many steps, you’ll find yourself looking out across the forest canopy and with luck at howler monkeys, paradise tanagers and toucans. By boat, raft or canoe. The Amazon’s many tributaries and ox-bow lakes are wonderful places to explore. 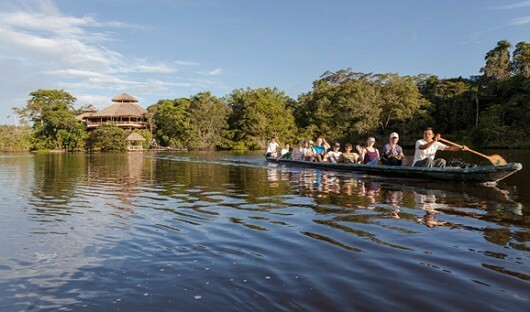 The lodges have river craft that enable you to explore the waterways that are home to yet another group of animals; capybara, giant river otters, hoatzin and caiman to name just four. Local communities; the Amazon’s original human inhabitants have an understanding and connection with their forest homes that date-back to a period long before Europeans arrived. Napo Wildlife Centre is part run by the local Amazonian community. 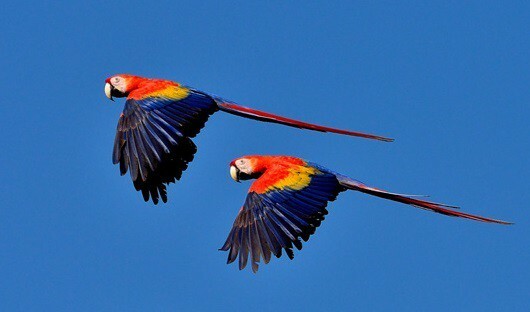 The bird life of Ecuador’s Amazon is breathtaking; macaws, toucans, trogons, ridiculously colourful tanagers, parrots to name a few of the ‘show stoppers’. Apart from monkeys, mammals are a little more challenging. As for monkeys you could see up to 13 different species, including howler, capuchins, tamarins and woolly monkey. Cats are infrequently seen, the more remote you go the chance of viewing the illusive jaguar increase. Giant river otters are more often seen on one of the ox-box lakes found within the forest. The largest mammal found in the forest is the Tapir – it’s very occasionally seen and very shy.